Russell Snyder (left) and Mark Lipping assist a customer. 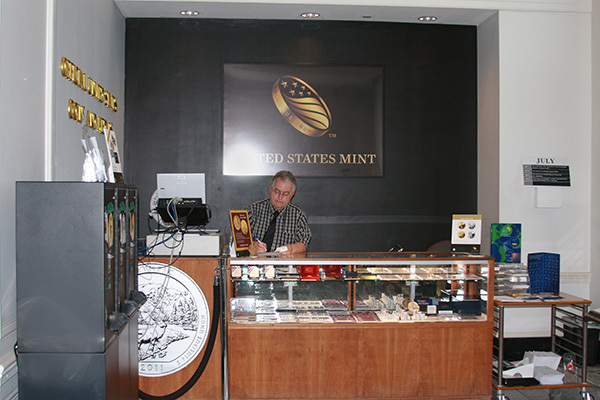 Longtime employees at Mint headquarters can’t help but notice the evolution of the sales counter since it opened for business in December 2004. The 120 square foot space now has a flat screen television that plays video footage of our employees and products. A new VeriFone machine processes credit card orders, replacing the old manual credit card swiper. New display cases showcase our beautiful products, and a new storage cabinet houses additional inventory. These incremental changes have helped to increase the public’s awareness of our products, improve customer service and–most important–increase revenue. Retail Sales and Conventions Manager James Pressley reported that as of April 11, 2015, the headquarters sales counter had exceeded $3.67 million in sales revenue. This represents a 37 percent increase over 2014 sales only seven months into the new fiscal year. Revenue generated from sales at conventions (e.g. 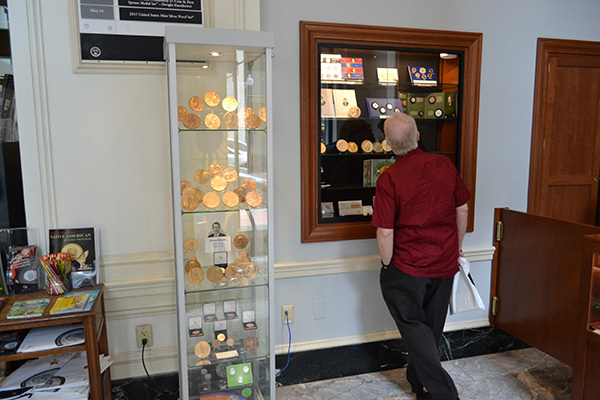 the American Numismatic Association World’s Fair of Money and the Florida United Numismatists Convention) is strong as well. As of the same period, convention sales revenue reached over $2.6 million, and is well on its way to surpassing the $3.63 million reported in 2014. Pressley attributes a huge part of this success to the Retail Sales Team, whom he says provides excellent customer service before, during, and after each purchase. Congratulations to Pressley and his team. Keep up the good work! Table 1: Breakdown of sales revenue.